Nexgrill 4-Burner Propane Grill Model# 720-0830H. Nexgrill Industries Inc. There has been a long line of big and shiny stainless steel gas grills over the years. They promise an attractive and powerful grill that will impress the neighbors and last for many grilling seasons. After all, stainless steel is durable and never stains, right? Unfortunately, appearances don't always tell the whole story. On the plus side, this grill does have four burners and plenty of heat, and a nice side burner. Unfortunately, the Nexgrill 4-Burner Model# 720-0830H Gas Grill is lightweight from top to bottom, and that means a product that simply isn't built to last. 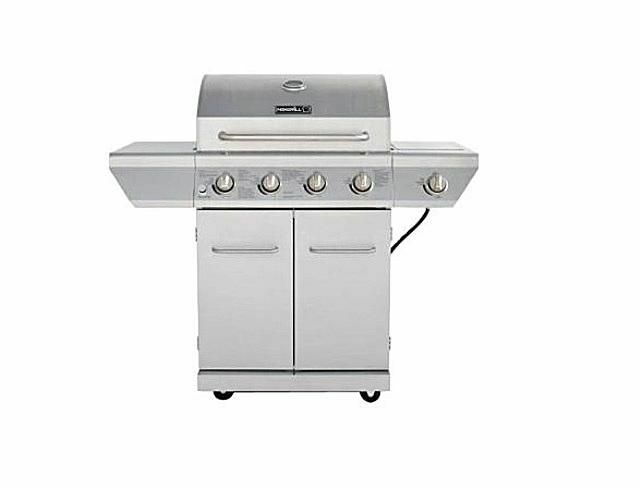 All in all, the Nexgrill 4-Burner at Home Depot is typical of a lot of the gas grills we find these days. The four burners can fit about 22 hamburgers, and the Even-Heat cooking system below the grates is designed to make sure all of your food is cooked uniformly. Described as "angled flame tamers," this feature prevents flare-ups, deflects the heat, and converts drippings into a flavorful vapor that infuses a smokey taste to your food. There are two stainless steel side shelves, one of which houses a side burner ideal for heating sauces or side dishes. Additional features are an upper-level warming rack, electric ignition, built-in thermometer, and casters for easy mobility. Big and shiny with lots of knobs, this grill seems like a great investment. The heat output is good, there is a large cooking area, and it does come with a pretty good side burner. There is an enclosed cart and lots of stainless steel, some of it of good quality. On paper, this looks like a reasonably good gas grill at a very good price. In reality, however, it leaves a lot to be desired. The real issue here isn't even the quality of the construction as much as the metal that goes into this grill. Nearly four feet tall, four feet wide, and more than two feet deep, this is a good sized gas grill. However, it weighs in at less than 100 pounds assembled. That isn't a lot of metal for something that is going to sit outside all year long and get heated up to well over 500 degrees every now and again. Gas grills take a lot of punishment, and this doesn't have the weight to take it. In order for this grill to be priced well under $300, and to have it shipped all the way from China, requires that it be made as light as possible. In addition, while including 304 stainless steel parts (burners, flame tamers, and main hood section), the quality has been sacrificed—even the cooking grates are only stainless steel coated (the manufacturer refers to this as "wrapping"). If you are looking to stay at this price point, you are better off purchasing something a lot smaller, probably without the side burner, and definitely without all that shiny, thin stainless steel.